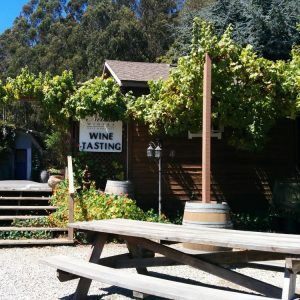 La Nebbia Winery is located in the charming coastal town of Half Moon Bay. Our winery is the oldest bonded winery in Half Moon Bay and has been a local landmark since 1979. Today we specialize in offering the California wine experience, all in one place. Our quaint and old world tasting room is open daily from 10am to 5pm and introduces visitors to a wide sampling of grape varietals and wines reflective of the expansive and diverse wine regions of California. The gardens and picnic areas throughout the property offer another great space for sipping wines, enjoying a picnic, and playing bocce ball. Our history, tradition, and legacy have been in our Barrel to Bottle gatherings. For nearly 40 years, customers would stop by with their empty bottles and jugs and we would fill them. Today, we continue that tradition and regularly have Barrel to Bottle events. The winery is also designed to accommodate corporate events and private parties. So whether you are celebrating a family milestone or team building with your colleagues, we can customize an event and elevate it from being something simply remembered to something extraordinary and memorable.